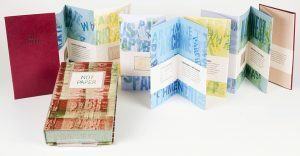 Book artists, papermakers, and letterpress printers Peter and Donna Thomas of Santa Cruz, California, formed their business partnership in 1977. Over the next forty years they produced more than 500 editioned, one-of-a-kind, and collaborative books and broadsides, establishing a prominent place in the contemporary American book-arts landscape. Their works are noted for their distinctive use of paper, structure, scale, binding, type, as well as the evenness of their printing and Donna’s simple but evocative illustrations. Peter and Donna Thomas’s presentation in the 2017 Ettinger Book Artist Series will cover those forty productive years, offering a view of their development as artists, printers, papermakers, structuralists, explorers, and scholars. In addition to the presentation, a retrospective exhibition of the Thomas’s work, Peter and Donna Thomas, The Work of Forty Years, will be on view in the Fourth Floor Exhibition Gallery of the Golda Meir Library through December 29, 2017. The event and exhibition are free and open to all. For more information or to arrange for special needs, please contact Special Collections at libspecial@uwm.edu or 414.229.4345.